Background and objectives: The Wharton’s jelly of the umbilical cord tissue contains a high density of mesenchymal stromal cells (MSCs). Wharton’s jelly derived mesenchymal stromal cells have immunosuppressive potential that can be utilized for treatment of autoimmune diseases such as type 1 diabetes (T1D). 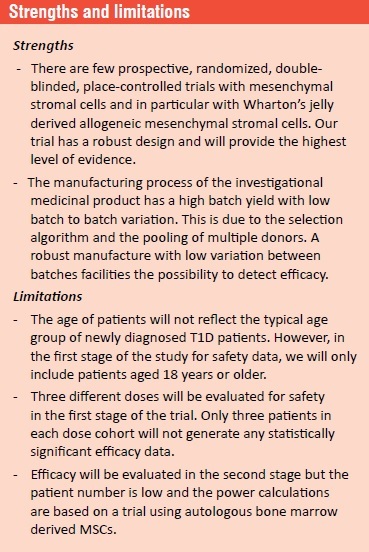 The objectives of this study are to assess the safety and efficacy of allogeneic Wharton’s Jelly derived MSCs (WJMSCs) in the treatment of T1D from the viewpoints of changes in beta-cell function, metabolic control, and diabetes treatment satisfaction during one year study period. Design: A two stage design. An open, non-randomized, dose-escalation scheme will be used in the first stage of the study, and a randomized, double-blinded, parallel, placebo-controlled scheme in the second stage of the study. Methods: The study population will consist of adult patients with T1D for < 2 years, 18–40 years of age (inclusive at both ends), only male in the first stage and both sexes in the second stage. In the first stage, a dose-escalation scheme with three doses will be evaluated for safety. The second stage will not be started until all patients in the first stage will have completed the 1-month follow-up visit. The second stage will recruit 15 patients who will be randomized to active treatment or placebo (2:1 ratio). Both patients and investigators will be blinded to the study protocol used in the second stage. Outcome measures: The primary outcome measure of this study will be safety. The secondary outcome measure will be efficacy of treatment, i.e., preservation of endogenous insulin production. This will be evaluated as delta change in C-peptide concentration in response to a mixed meal tolerance test, compared with before treatment. Discussion: By combining the first part (dose-escalation scheme) with the second part (double-blinded, parallel, placebo-controlled scheme), this study will provide both safety and efficacy data for the use of WJMSCs in the treatment of T1D. Obtained findings will guide on how to pursue this concept and indicate what dose of cells will be optimal for future trials. Ethics and dissemination: This study protocol was approved by the Ethics Committee Stockholm (approval number: 2017/1533-31/2) and the Swedish Medicinal Product Agency (EudraCT number: 2017-002766-50), and will be performed in accordance with the Declaration of Helsinki. Dissemination plans include presentations at scientific conferences and scientific publications. Patient recruitment was initiated in January 2018, and the first stage of the trial, the dose escalation, is expected to be completed for 1-month follow-up safety data, in the fourth quarter of 2018. Primary outcome measure will be estimated in 2020. Trial registration: ClinicalTrials.gov identifier: NCT03406585. Type 1 diabetes (T1D) is an insulin dependent, autoimmune disorder resulted from T cell mediated destruction of insulin-producing pancreatic beta-cells. At onset of T1D, beta-cell mass has regularly decreased to 20–40% compared to normal levels. Maintenance of residual insulin secretion is important for contributing to markedly lower hemoglobin A1c (HbA1c), less blood glucose fluctuations, and diminished risk of ketoacidosis. It also substantially decreases the risks of developing severe hypoglycemic events and late complications., An identified successful intervention may not only be used to prevent disease but also be applied to patients with ongoing disease before overt hyperglycemia, thereby providing means to halt disease progression. Different intervention strategies have been tested to save residual beta-cells, but at best only endogenous insulin production has been temporarily preserved. Wharton’s jelly derived mesenchymal stromal cells (WJMSCs) are known to have immunoprivileged characteristics. Thus, they express low levels of major histocompatibility complex (MHC) class I antigens and seem to be essentially devoid of class II antigens. Similar to trophoblasts, they have been shown to express human leukocyte antigen G (HLA-G), which may influence immunological properties. They also synthesize immunosuppressive molecules such as indoleamine-2,3-dioxygenase (IDO) and prostaglandin E2. The immunosuppressive functions of mesenchymal stromal cells (MSCs) are triggered by the surrounding microenvironment, where abundant inflammatory factors are released by immune cells. Detailed investigations addressing how the microenvironment affects homing and immunosuppressive effects of MSCs are still lacking. The purposes of this study are to determine whether intravenous infusion of allogeneic WJMSCs is safe in adult patients with T1D and to investigate changes in beta-cell function, metabolic control, and diabetes treatment satisfaction during one year study period. The study population will consist of adult patients with T1D (< 2 years), 18–40 years of age (inclusive at both ends), only male in the first stage and both sexes in the second stage of the trial. Since the study aims to preserve remaining insulin production, all patients eligible for study must have a fasting C-peptide concentration > 0.12 nM. Patients aged > 40 years often have a different progression of disease from that in younger individuals, with very slow loss of insulin production and no insulin-dependence at diagnosis (sometimes denoted as Latent Autoimmune Diabetes in the Adult (LADA)). Many of these patients show strong similarities to type 2 diabetes patients. To investigate the effects of intervention on T1D development in a study population without a strongly heterogeneous issue, we only include patients aged 18–40 years. In line with the Declaration of Helsinki, it is reasonable to first provide a safety and proof of principle study in young adults. Studies in children and adolescents would also require a stratified analysis with regards to beta-cell function evaluations, since progression of disease in children and adolescents is even more aggressive than in young adults. This is a two-stage design study. An open, non-randomized, dose-escalation scheme will be used in the first stage of the study, and a randomized, double-blinded, parallel, placebo-controlled scheme in the second stage of the study [Figure 1]. Note: The flowchart is an illustration of the trial flow but not a time plan. Stage 1 is a dose escalation stage, in which the safety data at 1-month follow-up visit will be analyzed by the Data Safety Monitoring Board before enrollment in the next dose. IMP: Investigational medicinal product. Patients are free to discontinue their participation in the study at any time for any reason without affecting their right to appropriate follow-up investigation and future treatment. Patients may be discontinued from the study at any time at the discretion of the investigator. Specific reasons for discontinuing a patient from further assessments are specified in the protocol. Randomization and blinding are only applicable for the second stage of the trial and will be performed with a web based randomization system. The randomization code will be created using a computer-generated randomization schedule prepared prior to the start of the study. The randomization will be made in blocks of three (batch 1, batch 2, and placebo). The different batches and placebo will have codes and the key is kept secret for both investigators and patients. Unblinding is conducted after end of trial. The manufacturer Polski Bank Komorek Macierzystych S.A. (PBKM) (Poland) receives donated umbilical cords from Szpital Położniczo (Poland). PBKM holds a production permit issued from Polish Medicines Inspectorate for production of ATMP for clinical trials with authorization number 239/0436/17. Cells from each donor will be analyzed and expanded separately. After being washed from substrate residuals and metabolic products, quality control analyses are performed to measure concentration of cells, sterility, viability, endotoxin, mycoplasma and phenotypic expression. PBKM sends cell samples to NextCell Pharma AB (the Sponsor) who will notify which of the cells in manufacturing should be used for the formulation of the IMP (ProTrans) based on the company’s proprietary selection algorithm. The product is prepared in advance before any subject is included in the trial and provided as cryopreserved. The cells are frozen in cryo bags at concentrations of 2 × 107 cells in 5% human serum albumin and 10% DMSO, and one cryo bag contains one dose. The bags are frozen in a controlled rate freezer and directly transferred to -190ºC for storage until it is time for infusion. Further details of the manufacturing process are described in the Investigator’s Brochure and Investigational Medicinal Product Dossier. The sponsor (NextCell Pharma AB) has developed a selection algorithm based on functional assays. The algorithm determines which cells and donors should be used for formulation of ProTrans (the IMP of the trial). The construction of this proprietary selection algorithm and which analyses are conducted is a trade secret. However, it is important to indicate that only cells and donors that pass the quality criteria of the manufacturer are considered in the selection and that all basic criteria for MSCs for clinical trial purposes are fulfilled. IMP or placebo will be given as an intravenous infusion using a peripheral venous catheter placed in a vein on the hand or arm. In the first stage of the trial, patients 1–3 will receive a single dose of 25 million cells, patients 4–6 will receive 100 million cells and patients 7–9 will receive 200 million cells. In the second stage of the study, all patients will receive a fixed single dose, which is preliminarily planned to 100 million WJMSCs in saline with 5% human serum albumin (HSA) and 10% DMSO or placebo consisting of saline with 5% HSA and 10% DMSO undiluted. Prior to infusion, all cells are diluted in 100 mL saline (NaCl, Baxter) which gives a final concentration of 0.95 × 106 cells/mL, 9 mg/mL sodium chloride, 0.2% human albumin and 0.5% DMSO. The safety and tolerance of intravenous infusion of allogeneic WJMSCs in adult patients with T1D. Changes in beta-cell function, metabolic control, and diabetes treatment satisfaction during one year study period. Safety parameters evaluated are adverse events, such as hypoglycemic episodes and allergic reactions. Besides anamnestic reports, ophthalmologic examination, ECG, vital signs, and laboratory assessments will be performed. Delta-change (Δ-change) of C-peptide area under the curve (AUC) (0–120 minutes) for mixed meal tolerance test (MMTT) on day 372 following WJMSC/placebo infusion when compared to test performed before start of treatment. Visit schedule is depicted in [Table 1]. Data management based on Good Clinical Practice (GCP) refers to the activities defined to achieve safe routines to efficiently enter subject information into a database, avoiding errors. The principal investigator is responsible for ensuring the accuracy, completeness and legibility of the data reported in the case report form (CRF). This will be inspected by the monitor on a regular basis before CRFs are submitted for data entry. The investigator will maintain source documents for each patient in the study. All information on CRFs will be traceable to these source documents in the patient’s file, with the exemption of data where CRF is used as a source. The data will be verified for missing data and inconsistencies, and for any necessary medical clarifications by the investigator. As this is primarily a safety study, only 24 patients will be included and undergo a dose escalation scheme. The second blinded part will be composed of 10 patients treated with 2 batches of WJMSCs and 5 placebo treated patients. A calculation of power and patient numbers has been performed for the second stage of the study, based on results for similar primary outcome variable from a previous study where patients were treated with autologous bone marrow-derived MSC (Delta-change of C-peptide area under the curve (0–120 minutes) for mixed meal tolerance test on day 372 following WJMSC/Placebo infusion when compared to test performed before start of treatment) and type of patients presented in [Figure 1] of the article written by Carlsson et al. Patients in the described previous study were treated with autologous bone marrow-derived MSCs, and we expect similar results, although this remains to be tested. For calculation of patient numbers, the second stage of the study was considered to contain three randomized groups (placebo, batch 1 and batch 2), and not to include any data from the first stage of the study (since this stage of the study is not randomized), n = 5 per group gives a power of 95 % and analysis of variance of the three groups should be significant and allow post hoc comparison between groups. Efficacy endpoints will all be evaluated as Δ-changes using Student’s unpaired two-tailed t-test. The full analysis set (PPS; for definition, see below) will be evaluated for all endpoints. Treatment difference will be estimated with 95% confidence interval. Non-normally distributed data with two nominal variables in exploratory endpoints will be analyzed by Wilcoxon’s signed rank sum test. Calculations will be performed in Prism (Graphpad Software, San Diego, CA, USA). A monitor from Karolinska Trial Alliance is responsible for coordinating the activities of the study and ensures adherence to The International Council for Harmonisation of Technical Requirements for Pharmaceuticals for Human Use (ICH) guidelines. Before study initiation, the protocol and CRFs were reviewed with investigator and staff. The monitor will visit the site during the course of study in order to verify adherence to the clinical study protocol, completeness and accuracy of data entered to the CRF by comparing them with the source documents. The monitor will review the progress of the clinical investigation, and review CRFs and original source data/documents with the clinical investigational personnel, for accuracy of data recording, and facilities used in the clinical investigation (e.g., local laboratory) may be reviewed. Visits will be documented in a monitory log in the investigator’s file and a monitor report for each visit will be sent to and signed by the sponsor. This study protocol has been approved by the Ethics Committee of Stockholm (approval number 2017/1533-31/2) (Additional file 1 [Additional file 1]), and will be performed in accordance with the Declaration of Helsinki. Written informed consent will be obtained from each patient (Additional file 2 [Additional file 2]). We will publish the findings in national and international journals, and present these at national and international conferences. The protocol adheres to the recommendations provided by the SPIRIT 2013. No or only minor side effects of MSCs have been observed in the clinical treatment of graft versus host disease, myocardial infarct, liver cirrhosis, or osteogenesis imperfecta. No increased risk of tumor development in patients has been reported, and no ectopic tissue formation has been observed., Similarly, in the first studies in patients with T1D, no side effects were observed., El-Badawy and El-Badri reported a meta-analysis of 22 studies where T1D was treated with stem cell therapy. They concluded that various stem cell therapies seemed to be safe and could potentially lead to remission of diabetes. There are three key components to treat T1D: to reduce hyperglycemia, to relieve autoimmunity and to regenerate lost islets. With strong evidence of immunomodulatory effect and transdifferentiation potential, MSCs can regulate the autoreactive host immune system and promote islet regeneration to replenish the lost islets. MSCs can alleviate self-reactive lymphocytes-caused inflammatory damage to newly-formed beta-cells because of their immunomodulatory properties. The ability of MSCs to secrete trophic and angiogenic factors may also restrict islet damage by establishing a microenvironment which stimulates beta-cell growth, survival, and differentiation. There is an increased need to describe the mechanisms of MSC-mediated cell therapy in detail. Well-designed large scale randomized studies considering the stem cell type, cell number, and infusion method in T1D patients are also urgently needed. WJMSC from this manufacturer has been used in hospital exemption procedures under various conditions and the safety profile of the cells is consistent and well tolerated with only mild and transient adverse reactions related to the product. However, serious adverse events and deaths have been reported in patients with terminal amyotrophic lateral sclerosis or grade 4 graft versus host disease who undergo WJMSCs therapy. The rational of ProTrans is to utilize the selection algorithm, developed by NextCell Pharma AB, to identify and select suitable donors and/or optimal MSC populations for formulation of a potent stem cell product with low batch to batch variability and sustained, well tolerated safety profile. Patient recruitment was initiated in January 2018 for the first part of the trial, i.e., the dose escalation. As of June 1, 2018 all three patients in the low-dose cohort and all three patients in the medium-dose cohort had been treated. The first part of the trial is expected to be completed to collect 1-month follow-up safety data in October 2018. Primary outcome measures will be estimated in 2020. No serious adverse events had been recorded on June 1, 2018. Patients treated in the low- and medium-dose cohorts had not suffered from any adverse events during the treatment. At the 1-month follow-up visit, only mild adverse events were reported, without any causality with treatment. POC is the principle investigator. POC and MGS are responsible for the design of the study and the study protocol. MGS drafted the protocol manuscript and POC revised it. Both authors have read and approved the final protocol manuscript. MGS is employed by NextCell Pharma AB and own shares in the company. This study is sponsored by NextCell Pharma AB. This study protocol was approved by the Ethics Committee Stockholm (approval number 2017/1533-31/2) and the Swedish Medicinal Product Agency (EudraCT number: 2017-002766-50), and will be performed in accordance with the Declaration of Helsinki. The statistical methods of this study were reviewed by the biostatistician of Karolinska Trial Alliance, Karolinska University Hospital in Sweden. Dissemination plans include presentations at scientific conferences and scientific publications. Individual participant data will not be available. However, the study protocol and informed consent form will be made available beginning 3 months and ending 5 years following article publication to investigators whose proposed use of the data has been approved by an independent review committee identified to achieve aims in the approved proposal. In order to gain access, data requestors will need to sign a data access agreement. Proposals should be directed to mathias.svahn@nextcellpharma.com. Madsbad S, Alberti KG, Binder C, et al. Role of residual insulin secretion in protecting against ketoacidosis in insulin-dependent diabetes. Br Med J. 1979;2:1257-1259. 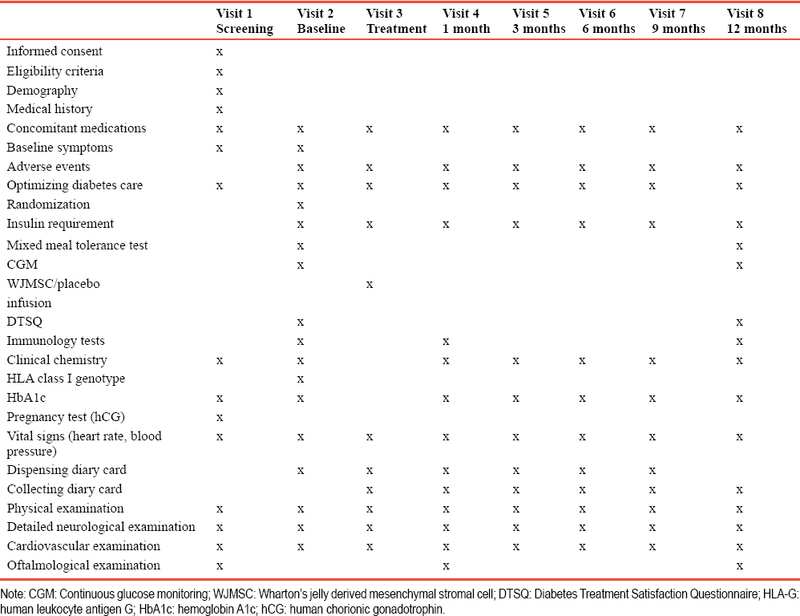 Steffes MW, Sibley S, Jackson M, Thomas W. Beta-cell function and the development of diabetes-related complications in the diabetes control and complications trial. Diabetes Care. 2003;26:832-836. Kalaszczynska I, Ferdyn K. Wharton’s jelly derived mesenchymal stem cells: future of regenerative medicine? Recent findings and clinical significance. Biomed Res Int. 2015;2015:430847. Ren G, Zhang L, Zhao X, et al. Mesenchymal stem cell - mediated immunosuppression occurs via concerted action of chemokines and nitric oxide. Cell Stem Cell. 2008;2:141-150. Ankrum JA, Ong JF, Karp JM. Mesenchymal stem cells: immune evasive, not immune privileged. Nat Biotechnol. 2014;32:252-260. Lalu MM, McIntyre L, Pugliese C, et al. Safety of cell therapy with mesenchymal stromal cells (SafeCell): a systematic review and meta-analysis of clinical trials. PLoS One. 2012;7:e47559. Hjort R, Alfredsson L, Carlsson PO, et al. Low birthweight is associated with an increased risk of LADA and type 2 diabetes: results from a Swedish case-control study. Diabetologia. 2015;58:2525-2532. Greenbaum CJ, Beam CA, Boulware D, et al. Fall in C-peptide during first 2 years from diagnosis: evidence of at least two distinct phases from composite Type 1 Diabetes TrialNet data. Diabetes. 2012;61:2066-2073. Carlsson PO, Schwarcz E, Korsgren O, Le Blanc K. Preserved beta-cell function in type 1 diabetes by mesenchymal stromal cells. Diabetes. 2015;64:587-592.
von Bahr L, Batsis I, Moll G, et al. Analysis of tissues following mesenchymal stromal cell therapy in humans indicates limited long-term engraftment and no ectopic tissue formation. Stem Cells. 2012;30:1575-1578.
von Bahr L, Sundberg B, Lonnies L, et al. Long-term complications, immunologic effects, and role of passage for outcome in mesenchymal stromal cell therapy. Biol Blood Marrow Transplant. 2012;18:557-564. Hu J, Yu X, Wang Z, et al. Long term effects of the implantation of Wharton’s jelly-derived mesenchymal stem cells from the umbilical cord for newly-onset type 1 diabetes mellitus. Endocr J. 2013;60:347-357. El-Badawy A, El-Badri N. Clinical efficacy of stem cell therapy for diabetes mellitus: a meta-analysis. PLoS One. 2016;11:e0151938.